(From Fujifilm lens literature) The new FUJINON XF56mmF1.2 R APD (Apodization) is a fast and nearly silent lens for FUJIFILM X-Series CSC’s that has a maximum aperture of F1.2 to make it the world’s brightest autofocus lens for digital cameras with an APS-C sensor. In addition, the new apodizing filter makes it the ideal choice for portrait photography where every detail is crystal clear, with images set on a gorgeous bokeh with smooth outlines for pictures with a three-dimensional feel. The XF56mm F1.2 R APD is constructed of 11 glass elements in eight groups, including one aspherical glass molded lens element and two extra low dispersion lens elements. 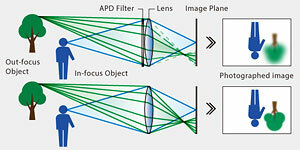 Spherical aberrations are corrected by the aspherical glass element to deliver high resolution at the maximum aperture setting. Additionally, thanks to the combination of two extra-low dispersion lens elements and three cemented lens elements, chromatic aberrations are greatly reduced. The FUJINON XF56mmF1.2 R APD will be available in December 2014 for USD $1,499.95.